In Croatia, all through February is the time to file the income tax report (porezna prijava). 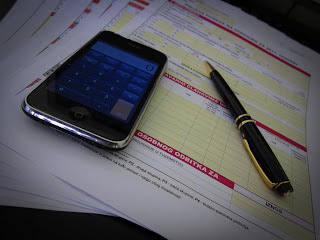 Last year, I became a dependant of my husband, so we filed the tax report. In Croatia, 900Kn is deducted from tax for each of the first and second dependants, and 1800kn for the third dependant. To check what is tax deductable, visit the website of the Croatian Ministry of Finance and click the folder titled "Porezna Oslobođenja, Olakšice i Porezno Priznati Izdaci za Građane". Making a tax report is quite easy. You just need to visit the website of the Croatian Ministry of Finance or the website of Erste Bank and download a excel sheets, which is available through February. You can file the tax report at your local tax office (porezni ured) or mail the tax report to the local tax office. Also, you must attach the tax card (PK obrazac) issued by your company and a copy of a marriage certificate (Vjenčani list), which should be issued within 3 months, if you are married and if you claim for tax deduction for your spouse. You have to attach new marriage certificate each year you file the tax report. I also filed a tax report in Japan, because I paid for dental braces and lasik. I'm thinking about writing my experiences of having the braces and lasik operation later. Anyway, in Japan, both are not covered by health insurance, but are included as tax deductable medical services. Filing the tax report in Japan must be done in a period from 16 February until 15 March. You can make the tax report online at the website of the National Tax Agency. Then, print it out and file at the local tax office. In Japan, the applicant must file the report. However, if you can't, like me who currently lives outside Japan, you need assign your family or friends as your agent and file the tax report together with the assignment, the tax card issued by your company and all receipts of tax deductable expenses. It seems like I should have applied for e-Tax in Japan, which enables me to file the tax report online. But, to apply for the e-Tax, I need register myself as a residence in Japan. So, those who lives outside Japan and doesn't have a residence registration in Japan cannot use the e-Tax... Maybe, I should have applied for it before I moved to Croatia.